Stunning modern-classic shape with charcoal-gray crown. Low-forward CG promotes high launch, fast ball speed and low spin for phenomenal distance. Easy and intuitive SLDR sliding weight promotes up to 30 yards of shot shape adjustment. 21 SLDR weight positions to dial in the desired shot shape. Increase or reduce the loft up to 1.5Degree with 12-position loft-sleeve for optimal trajectory. Silver button-back works with subtle crown markings for easy clubface alignment. Fujikura Speeder 57 shaft blends light weight with great feel and playability. 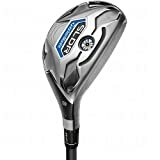 SLDR fairways woods and Rescue clubs combine two of TaylorMade’s most recent innovations: Speed Pocket technology and an exceptionally low-and-forward center of gravity (CG) location. Smaller is better. The new Speed Pocket is smaller (introduced in the RocketBallz fairways and Rescues), which actually makes it more efficient at increasing how fast the face flexes at impact, promoting faster initial ball speed across a wider portion of the face, which helps you get consistently long distance on every swing. 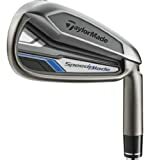 The new Speed Pocket design also gave TaylorMade engineers room to move the club head’s CG lower and farther forward, to a place that promotes faster ball speed and a lower spin-rate. We learned with the SLDR driver that a low-forward CG location allows many players to increase their loft to achieve the right combination of high-launch/low-spin that promotes maximum distance. The same thing goes for SLDR fairway and Rescues, which is where our Loft Sleeve technology serves such an important purpose, by allowing you to adjust the loft 1.5Degree up or down to dial in their optimal launch conditions. Visually, SLDR fairways and Rescues incorporate the same rich, charcoal-gray crown and traditional shaping as the SLDR driver. The dark crown-color contrasts beautifully with the silver-colored clubface to make it easy to align the face accurately at address. Designed to help launch higher, longer and straighter The Rocket Bladez High Launch iron have higher lofted heads to promote easier launch. The deep undercuts and thin faces to help maximize distance. The vibration and sound control system promotes excellent feel and sound too. 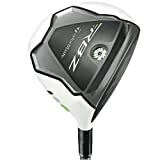 Find more TaylorMade Golf Clubs products on Amazon!